LAS VEGAS — If the last two weeks are any indication, Ford’s disadvantage against the other two manufacturers in the Monster Energy NASCAR Cup Series has been decidedly erased. One week after Kevin Harvick rolled to a dominant victory at Atlanta Motor Speedway, Ryan Blaney continued the Blue Ovals’ roll by scoring his third-career Monster Energy NASCAR Cup Series pole position on Friday evening at Las Vegas Motor Speedway. Blaney, who was third or better in all three knockout rounds, saved his best for last when he toured the 1.5-mile oval in 28.200 seconds (191.489 mph) with his No. 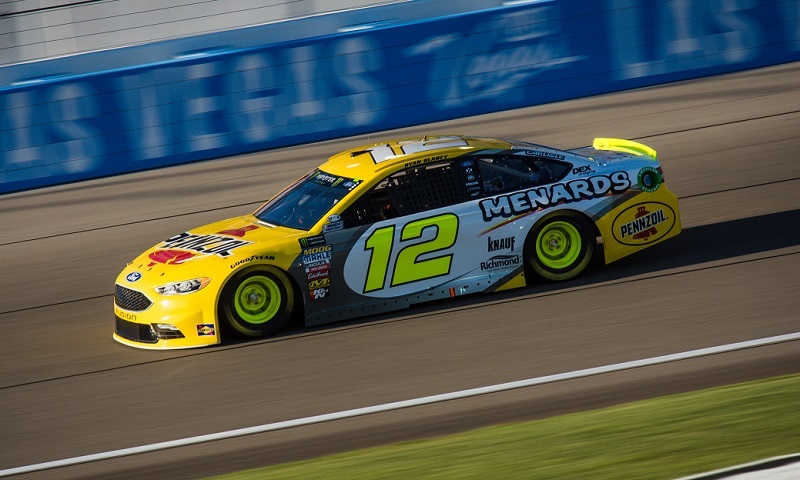 12 Menards/Pennzoil Ford to earn the top spot on the grid for Sunday’s Pennzoil 400 (3:30 p.m. ET, FOX, PRN, SiriusXM). The pole effort was Blaney’s first of the season, made his the 14th different driver to win a Cup pole in Sin City and came on a challenging day where wind gusts across the track climbed as high as 40 miles per hour at times during the three sessions. Harvick won’t be very far from the front of the field, however, joining Blaney on the front row after posting the second-fastest lap (28.384/190.248) in his No. 4 Jimmy John’s Ford. The 2014 Cup champion admitted after his run that he knew exactly where he could have made up some of the time he lost to Blaney.